With ribbon to denote service in SIERRA LEONE. From: 5th.,May 2000 to 31st., July 2002. 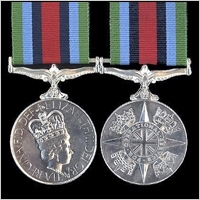 For operations: Maidenly and Barras, a Silver Rosette is worn on the Medal Ribbon.